Once again, the media got the story completely wrong. For weeks, we were told endlessly and repeatedly about how the "extremist settlers" would use violence, even gunfire, to prevent the Gaza withdrawal from taking place. Pundits and commentators had a field day, competing with each other to paint ever darker scenarios about the lengths to which the "gun-toting Jewish militants" would go to thwart the planned retreat. And then, in one fell swoop, the media and its calumnies were revealed to be little more than ignorant propaganda. Under incredibly trying circumstances, the Jews of Gush Katif conducted themselves with dignity, showing their fellow Israelis and the rest of the world just how wrong they have been to demonize and delegitimize them as "fanatics" and "extremists". There was no gunfire, only tears and prayer and hope that one day they will return. But don't expect any mea culpas from the media, which is more interested in ratings than in truth. 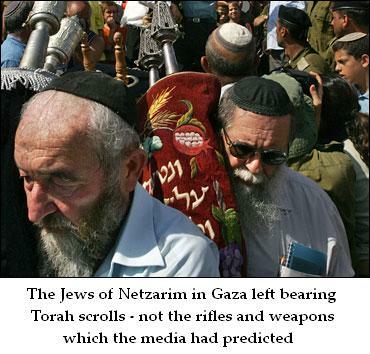 The bottom line is that the Jews of Gush Katif left with their heads held high - unlike most of the reporters who covered them.